Students are expected to wear the correct Gleeson College uniform and to do so in a manner that signifies pride in both the College and their own personal appearance. The correct uniform is to be worn on all occasions when attending the College or when representing the College. We ask for the support of all families in ensuring that students present themselves appropriately attired in the correct uniform as outlined below. *Uniform items can be purchased from either our onsite Totally Schoolwear store or the retail Totally Schoolwear store at Modbury. Alternatively, our Second Hand Uniform Shop has a range of good quality items and is open every Tuesday after school from 3.30-4.30pm, and also available Monday to Friday via appointment by phoning the College on 8282 6600. The Gleeson College Leadership Team reserves the right at all times to make final decisions regarding uniform and presentation. Maroon blazer, maroon Gleeson College jumper, open necked short-sleeved monogrammed white shirt, worn untucked, charcoal grey shorts or trousers, black leather-upper College shoes (not boots, sneakers, soft shoes or suede shoes) and grey socks. Grey College socks, with the maroon and white stripe, are to be worn with the shorts. Only black or charcoal grey belts with a plain buckle are permitted to be worn. Maroon blazer, maroon Gleeson College jumper, long sleeved monogrammed white shirt, worn tucked in, College tie (tied correctly and securely), charcoal grey trousers, black leather-upper shoes (as above) and grey socks. Only black or charcoal grey belts with a plain buckle are permitted to be worn. Scarves may be worn with the winter uniform, to and from College and in the yard at recess and lunchtimes. No other garments are to be worn with the uniform - in particular, polo neck skivvies and hooded tops under shirts, nor T-shirts under open neck shirts. Body art and undergarments should not be visible. Maroon blazer, maroon Gleeson College jumper, summer dress (worn below the knee, with the half belt fastened correctly), black leather-upper College shoes, with a heel of no more than 3cm (not boots, sneakers or soft shoes, suede shoes, platform soles or high heels) with white College socks (sport socks or tennis style socks are not to be worn with the uniform). Maroon blazer, maroon Gleeson College jumper, white long sleeved monogrammed shirt worn tucked in, College tie (tied correctly and securely), winter skirt worn below the knee, long grey socks or opaque mid grey stockings and black school shoes (as above). Tailored, monogrammed charcoal grey trousers are an additional option to be worn with the College long sleeve shirt and tie. Scarves may be worn with the winter uniform, to and from school and in the yard at recess and lunchtimes. No other garments are to be worn with the uniform - in particular, polo neck skivvies or hooded tops under shirts, nor T-shirts under open neck shirts. Body art and undergarments should not be visible. To and from school and during lessons: on days in which PE practical lessons fall, students are only permitted to wear the Gleeson College tracksuit, track pants and rugby top, maroon and grey shorts, maroon and grey polo shirt, white monogrammed sport socks, suitable track shoes, and maroon Gleeson College cap or bucket hat. To and from school: on days in which practical lessons fall, students are only permitted to wear the Gleeson College maroon and grey World Football polo top, maroon and grey PE shorts and white monogrammed sport socks, with suitable track shoes and Gleeson College cap or bucket hat. Students are not permitted to wear their Gleeson College World Football strip, shorts or football socks to/from school or outside of World Football practical lessons. 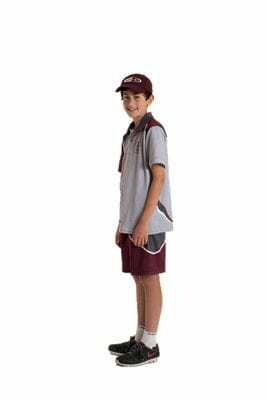 To and from school: on days in which practical lessons fall, students are only permitted to wear the Gleeson College maroon and grey Netball polo top, maroon and grey PE shorts and monogrammed white sport socks, with suitable track shoes and Gleeson College cap or bucket hat. Students are not permitted to wear their black netball shorts to/from school or outside of Netball practical lessons. Sport shoes are to be supportive and have non-marking soles (casual, loosely laced shoes e.g. 'skate-type' and 'Dunlop Volley' are not permitted). 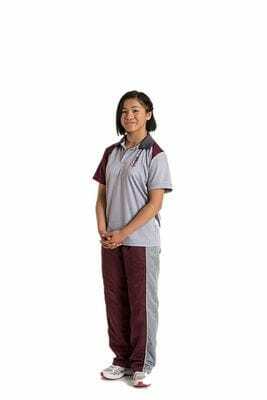 During Terms 2 and 3, the Gleeson College track pants and rugby top or the Gleeson College tracksuit are to be worn to and from the College as the outer garments. If this is not possible, students will need to wear the winter uniform and change into PE uniform for practical PE lessons. Students will need to change into winter uniform with the blazer for Assemblies, Liturgies and other formal occasions when they are presented on stage. 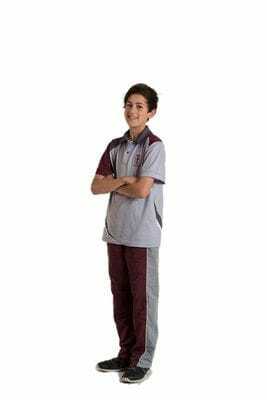 The Gleeson College PE uniform may be worn for other events or activities, at the discretion of the subject teacher and as approved by the Leadership Team. SUN PROTECTION > In response to current information about the harmful effects of the sun on the skin and one's personal well-being, at Gleeson College all students are expected to wear the monogrammed Gleeson College cap or bucket hat when they are participating in any activity in the sun as well as for the Physical Education lessons which are conducted outside. Hence all students are required to have either the monogrammed Gleeson College baseball-style cap or bucket-style maroon hat to be worn as part of the uniform. Sun protection is encouraged any time students are outdoors (Refer to Gleeson College Sun Protection Policy). HAIR > Hair styling is also part of the Gleeson College uniform and must be kept in a clean, neat and tidy manner at all times. Hairstyles are to be moderate and not extremes of style (as determined by the College). For example, undercuts, significant differences in length, lines or symbols cut into the hair, dreadlocks, etc. are not permitted. All students with hair below collar length or which falls or has the potential to fall across the eyes must be restrained with simple black, grey, maroon or white hair ties or ribbons (clips and headbands are not deemed sufficient). Artificially coloured hair other than in natural colour is not permitted; this includes brightly coloured streaks or highlights and obvious variations in colour, which draw attention. Items used to restrain hair must be maroon, grey, brown or black and accessories such as flowers, feathers, 'scrunchies' and wide headbands/bandannas are not permitted. Hair extensions, including eyelash extensions, are not permitted Braided hair is not permitted unless prior approval is sought from the Principal. Facial hair and excessive side burns below the middle of the ear are not permitted..
JEWELLERY > A fine silver or gold chain may be worn (any associated pendant must be a Christian or religious symbol) and one simple ring on each hand is permitted. The ring should not be large, obvious or of a cult nature. A student with pierced ears may wear no more than two simple gold or silver studs (3mm in diameter) or sleepers (5-10mm or 5c piece size) in each ear. No other visible piercings or clear coverings of piercings are permitted. This includes tongue and facial (nose and eyebrow) piercings. It is emphasised to students that if they have piercings done that do not meet the guidelines as set out in this policy, they will not be allowed to keep their studs/sleepers in 'so the hole won't close over', even with a band-aid or clear piercing applied. Students are permitted to wear only one slim gold/silver bracelet or solid gold/silver bangle and a watch. MAKEUP > Light, natural tones only. Obvious make-up, including foundation, lipstick, eye shadow, mascara/eyeliner and stencilled eyebrows, are not permitted. Nail polish and false finger nails are not permitted. BLAZER > During Terms 1 and 4, the jumper or blazer may be worn as an outer garment to and from school. During Terms 2 and 3, the Gleeson College blazer must be worn to and from school. The College jumper is never worn as the outer garment outside of the school grounds during these two terms. The blazer must be the outer garment worn to and from school, to assemblies and liturgies, on excursions and on any other formal occasions in Terms 2 and 3. *A new blazer with white braid edging was introduced in 2018. All new Year 7, 8 and 9 students are required to purchase the new College blazer with white braid. Please note that Devon are happy to update second hand blazers by applying the white braid at a cost of $35. COLLEGE BAG > All students are required to use a maroon, monogrammed Gleeson College backpack. The bag remains in the student's locker throughout the course of the day. Students should not be carrying 'handbags' to and around the College. An appropriately coloured, generic (non-Brand name) laptop bag is also acceptable to protect the student's personal device. SHOES > Platform soles and high heels are not allowed. Some judgement must be made about the thickness of the soles of the shoe, but a recommendation is that 3cm is as thick as would be acceptable. Shoes must be black leather-upper College shoes, not boots. They must not have soft or suede uppers, or be sneakers or hiking shoes, even if they are totally black. Laces must be black. SIZE OF UNIFORM > Dresses and skirts must be of correct length (worn below the knee) and winter College shirts must be long enough to be amply tucked in. PE shorts must be of correct length as manufactured, falling to the lower thigh. SOCKS > Male students must wear grey College socks with maroon and white stripes, with the summer and winter uniform. Female students wear white College socks with maroon stripes, with the summer uniform and grey College socks with the winter uniform. Only white monogrammed Gleeson College sport socks are to be worn with the sports uniform. SCARVES > These may be worn during Terms 2 and 3 with the winter uniform. If worn, they must be the grey monogrammed College scarf. Scarves may have to be removed in class at the request of staff if they present a WHS concern.